"Designing Disney" sets into history and puts into context the extraordinary contributions of the late John Hench, who, at the age of 94, still came into his office at Imagineering each day. His principles of theme park design, character design, and use of color made him a legendary figure, not only for Disney fans but also for students and aficionados of architecture, engineering, and design. 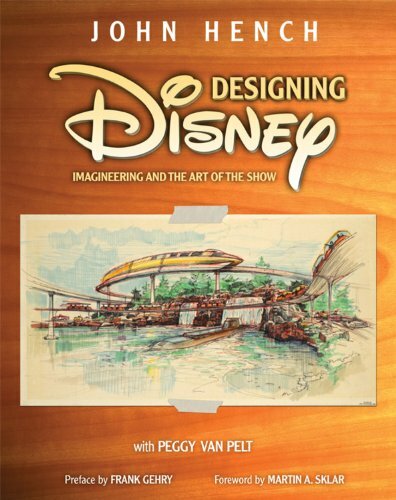 "Designing Disney" reveals the magic behind John's great discoveries and documents his groundbreaking in several key areas: "Design Philosophy" examines the values, attitudes, aesthetics, and logic that went into the original concepts for Disney theme parks. In "The Art of the Show" and "The Art of Color," Hench reveals the essence of what makes the parks work so well. And in "The Art of Character," he lets the reader in on the how and why of the Disney characters' inherent popularity--their timeless human traits, archetypal shape and gestures that suggest these qualities graphically, and their emotional resonance in our lives.